« Homepage / Gourmet / "Bienvenu à Patois: New Orleans bistro elevates the art of French cuisine"
When Chef Aaron Burgau speaks about the various ingredients he uses in the dishes he creates at Patois, his eyes light up and you can sense his ongoing love affair with food. 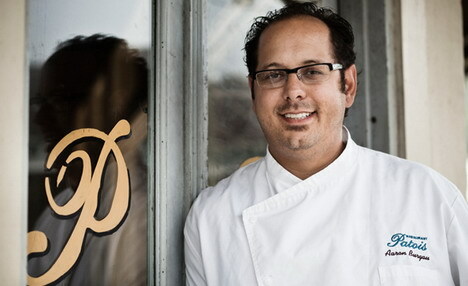 A passionate chef, he presents a unique brand of French cuisine that embraces his Louisiana roots. Chef Burgau brings equal measures of luxury and down-home goodness to diners at Patois, where he ingeniously incorporates locally produced, farm-fresh ingredients into his reinterpretations of French and Mediterranean classics. A former protégé of acclaimed chefs Gerard Maras and Susan Spicer, Burgau constantly creates different menus tied to the seasons at his charming uptown bistro located in a quiet New Orleans neighborhood. Segments of HBO’s Treme depicting Chef Janette Desautel’s restaurant (played by Kim Dickens) have been filmed here. Formerly Norby’s, a po-boy joint that occupied the space for many years, Patois was redesigned by Cain Construction after Burgau and his partners acquired the property a few years ago. The result is an intimate, inviting space with two beautifully crafted dining rooms, a long bar, and large windows overlooking tree-lined Laurel Street. For lunch, I like to grab a table near the windows in the front dining room to enjoy the sunny view. Not to be missed on the lunch menu is the potato gnocchi prepared in a crab batter, crowned with jumbo lump crabmeat, fragrant chanterelle mushrooms, and topped with Parmigiano-Reggiano cheese. Chef Burgau’s charcuterie plate is like no other: although I usually don’t enjoy hogs head cheese, his unique version is delicious, packed with flavor and devoid of the usual gelatinous overkill, while the house-made boudin is truly outstanding. Rounding out the plate is a superb rabbit terrine accompanied by tangy little house-made cornichons. This time of year, as the weather gets chilly, I like to order the dark-roux smoked rabbit, andouille, and greens gumbo that sends me back to my roots. This is comfort food at its best. An outstanding starter is the succulent grilled lamb ribs, which are a tad spicy, fall-off-the-bone tender, and melt in your mouth, served with a green tomato relish that lends just the right touch. Recommended salad offerings for lunch include the tender and generously apportioned fried chicken salad with hothouse tomatoes, Benton’s bacon, Gerard Maras farm sprouts and Hollygrove arugula in a smooth avocado dressing; and the delicious crispy duck confit salad served with Granny Smith apples and toasted walnuts, finished in an apple butter vinaigrette. Patois also offers a delicious Kobe beef burger with Gruyere cheese for lunch, dressed with fried Vidalia onions, and a “Patois” sauce. In fact, the burger gained such popularity among the lunch crowd that Chef Burgau and his Patois partners decided to open Tru Burger on Oak Street earlier this year. The new spin-off eatery offers excellent burgers and other casual all-American fare, including exceptional fries tinged with dill. The delectable buns were created from Burgau’s own recipe, and are solely produced for Tru Burger by Leidenheimer’s, the company that is famed for making the best po-boy bread in New Orleans. 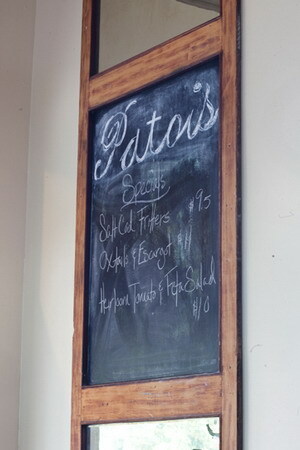 The dinner menu at Patois offers an extensive array of appetizers including sautéed sweetbreads, fresh mussels in a smoky Creole tomato broth with saffron aioli, a very nice cheese plate, and crispy pork belly with seared scallops drizzled with a Steen’s cane syrup and mustard sauce. Main course dinner offerings include the excellent Muscovy duck breast with braised bok choy, a kimchee pancake, black garlic, and a sweet and sour duck jus. The generously apportioned grilled hanger steak is another winning entrée, prepared in a red wine and marrow reduction accompanied by fries and a smoked red onion marmalade. Seared scallops are embellished with locally-grown golden chanterelles, roasted potatoes, red pepper purée, and a sweet corn sauce as the final flourish. The Gulf shrimp with house-made fettuccine is a great choice if you are in the mood for fresh local seafood; this is rivaled by the lump crab with pasta, engulfed with brandy, leeks, and roasted corn, tinged with tarragon. Patois’ brunch has become increasingly popular. You can get a hit-parade of signature appetizers, salads, sandwiches, and entrées such as the Gulf shrimp and pasta dish, in addition to free-range chicken breasts, panéed pork chops, and almond-crusted Gulf fish du jour, bathed in a citrus meunière sauce. The desserts, prepared by pastry chef Lisa Gustafson, warrant their own menu. In the French tradition, a cheese plate is offered (my favorite ending to a meal). Those with a sweet tooth will enjoy a variety of offerings including the homey apple galette with brandy caramel and vanilla bean ice cream; an outstanding carrot cake with chai ice cream, bourbon Anglaise, and ginger carrot ribbons; almond bread pudding; a selection of house-made sorbets and ice creams; and the tour-de-force “snickers” dessert: a brown sugar cake with caramel chocolate mousse, chocolate sorbet, and a luscious chocolate sauce. The cappuccino here is excellent; French press coffee is also available. Service is tops. 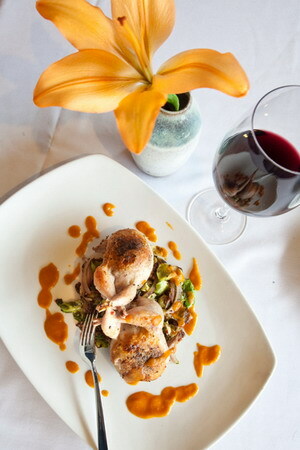 Here you can write a comment to the post "Bienvenu à Patois: New Orleans bistro elevates the art of French cuisine"